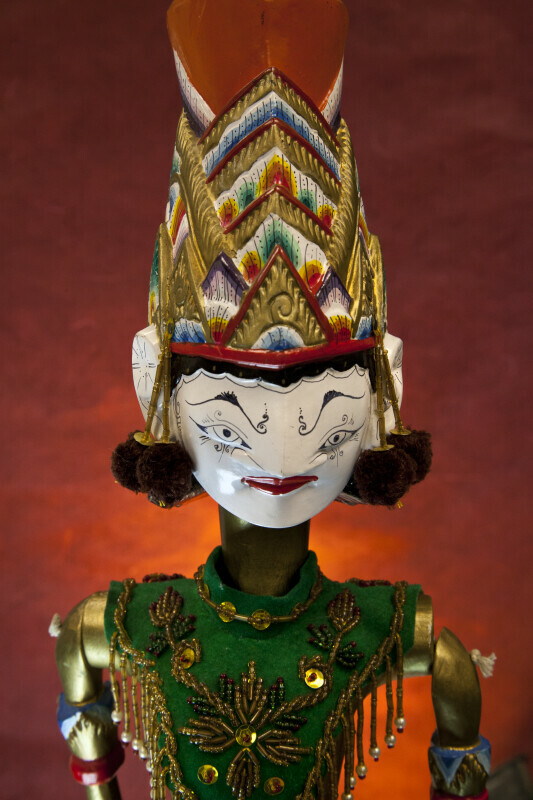 Wooden rod puppet (wayang golek) of Rama, from the Hindu legend called Ramayana. The Rama doll is made entirely from wood. His head and magnificent crown are three-dimensional, carved and hand painted. The headpiece is has a top portion painted red; the lower portion is gold, white, red, yellow and purple. He has tassels hanging on either side of the head. His face is painted white, with red lips, and decorative swirls. The figure is about 27 inches (69 cm) tall. WARNING: You are about to download a 40.5 MB TIFF!